Fine dining restaurant quality Veal and Crab Florentine, perfectly cooked veal topped with spinach, flaked crab, and sliced tomatoes in a seasoned broth made at home! I thought about making it myself many times, but never did until this past week. The only thing I could say I did wrong was I used a package of frozen spinach instead of fresh and I flaked the crab too much. When I make it again (and trust me I’m not waiting over 3 years again!) I will use fresh spinach, but frozen is fine if you happen to have it. It sounds like a lot of ingredients, but it’s really not and it’s faster to prepare than it looks. This delicious, 5-star quality meal can be ready in under an hour! If you thaw the frozen spinach ahead of time or under running water, that is. Last week I mentioned that my “niece” that is a vegan moved in with us. I made her a completely vegan version of this using mushrooms instead of the veal that I will be sharing with you next week. Next week, I am also taking part in #PumpkinWeek on Monday and Friday, I can’t wait to share those recipes. Here’s a hint, one of them has my favorite ingredient, bacon! 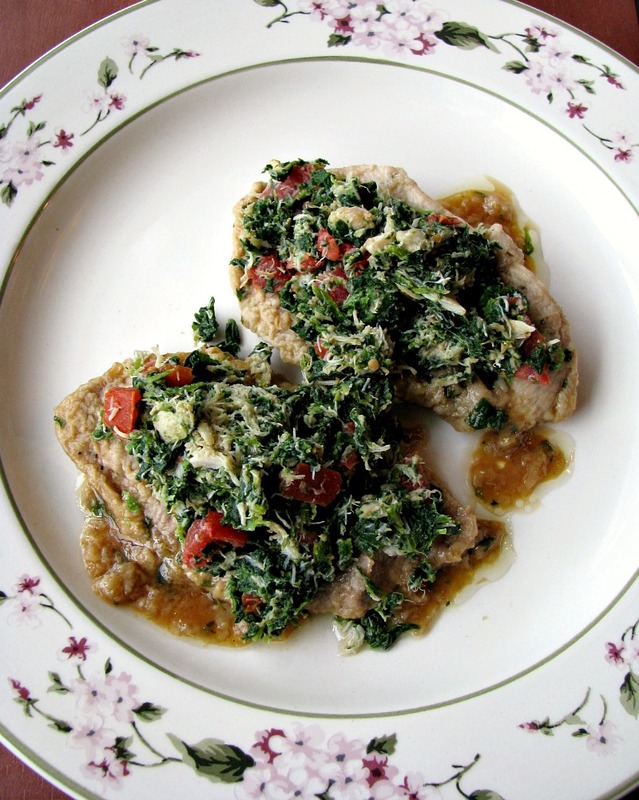 Fine dining restaurant quality Veal and Crab Florentine makes a great elegant dinner you can make easily at home! Thaw the spinach in a colander and squeeze as much water as possible out of it. Pick through the crab for shells. 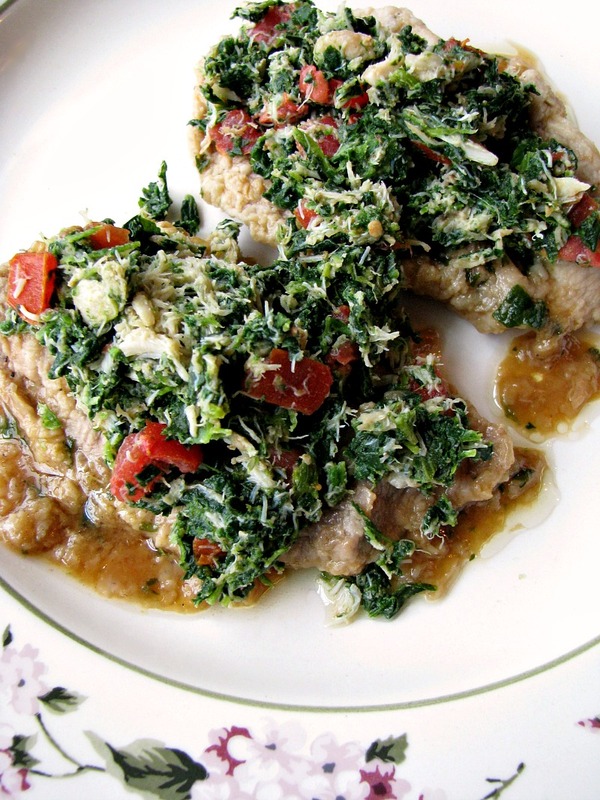 In a medium bowl combine the spinach and diced tomatoes, fold in the crab. Season to taste with salt and pepper. In a shallow bowl, combine the flour, 1/2 teaspoon salt, and 1/4 teaspoon black pepper. Coat each piece of veal in the flour. Heat the olive oil in a large frying pan over medium-low heat. Brown the veal in the oil for about 3 minutes on each side, until lightly browned. Remove from the pan to a plate. Add the beef stock, parsley, garlic powder, and pepper to the pan, scraping up any browned bits from the bottom of the pan. Add the veal back to the pan, cover and simmer gently for 10 minutes, turning once or twice. Melt the butter in a separate pan, add the crab mixture and cook, stirring occasionally, until heated through. 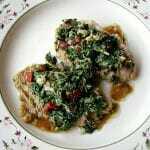 Divide the veal between plates, top evenly with the crab, spinach, tomatoes, and a small amount of the broth. Serve hot.